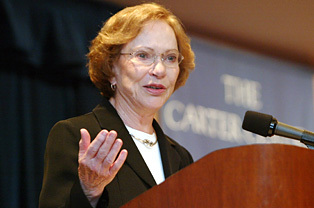 ATLANTA…The Carter Center and the Universidad de La Sabana, a private accredited university in Colombia, announced today three new recipients of two fellowship slots for Colombia’s Rosalynn Carter Fellowships for Mental Health Journalism. Since 2013, the two organizations have worked together to award annual fellowships to local journalists to investigate and produce a comprehensive project shedding light on mental health issues in the nation. For more than two decades, the Center has awarded one-year fellowships to nearly 200 journalists to connect them with resources and experts to increase the quality and accuracy of mental health reporting around the world. The program is currently in Colombia, the United States, Qatar, and the United Arab Emirates, and was previously in New Zealand, South Africa, and Romania. The Carter Center provides training, educational materials, mentorship, evaluation tools, and technical assistance to La Sabana to develop a sustainable and tailored program to Colombia. La Sabana manages the program in Colombia and is responsible for the selection of journalists, facilitating media trainings and conferences, adapting the program to meet local needs, and developing local evaluation strategies. Topic: A TV project aiming to explain the reasons behind the increase of suicides in Colombia, particularly among young populations between 5 and 17 years old (244 cases in 2016). This 45-minute TV program will be produced to analyze these phenomena as well as provide TV audiences with tools that help them to prevent this problem in vulnerable schools and communities. Topic: An online project investigating post-conflict mental health issues in Colombia. Some questions that will be explored will focus on how victims are overcoming trauma and whether there is access to public services and programs designed to ensure a stable peace. Following its traditional in-depth reporting style, the website Lasillavacia.com will publish 10 investigative multimedia stories that will answer these important questions.